WOULD YOU LIKE TO GET UNSTUCK, CLEARER AND MORE CONFIDENT SO YOU TAKE PURPOSEFUL ACTION FOR YOUR JOB AND CAREER? DO YOU WANT TO GAIN AN EDGE OVER OTHER GRADUATES IN THE JOB MARKET AND SHAPE A BETTER WORKING LIFE? ARE YOU LOOKING FOR SELF-DIRECTED LEARNING THAT SAVES YOU TIME AND TAKES THE GUESSWORK OUT? WELCOME TO THE LEARNING TO LEAP ONLINE SCHOOL! We know that it’s important to you not to waste time and money on poor quality, low value for money, online courses that don’t deliver what they say on the tin. The proof is in the eating, so why not give us a try? You have come to the right place if you want to be more employable, to enhance your chances of getting the job you want, and to clarify your career direction. Our online school has affordable bite-size courses accessible on any device and in the multi-media formats you enjoy. Subscribe to a single course for a month’s access. Who are our online courses for? Maybe you are someone who has never used job and career support before and relies on luck. Perhaps you have tinkered with job and career support but haven’t got it right yet. Or you are someone who has used job and career support but with no significant success. You know that employers want employable graduates with work experience who can hit the ground running; that competition is high because supply outstrips demand for graduates; that you need to stand out to have a better chance of success. You know you can’t rely on the bank of Mum and Dad forever. You know that you need a sustainable income to become truly independent. Maybe you haven’t found anything that allows you to make use of your degree or the opportunity to grow as a person or to develop into a young professional with potential. All the solutions in the marketplace seem to focus narrowly on specific tactics. You don’t have time to work out which advice is relevant to your situation and needs, and how they all the separate solutions on offer fit together. Currently, we have 20 courses available for instant access. More are planned in line with what you say you want and existing ones are kept up-to-date (so you do too). Each course lasts between 1 and 3 hours maximum. Learn when, where and how you want! What do I get with each course? videos, podcasts, articles, blogs, and free questionnaires to deepen your knowledge and understanding. You also get an invitation to the Career Navigators Community, a closed Facebook Group where you can get the support and challenge of David Shindler and other course participants to help you as you work through the content. The online courses are about personal development, not assessment. You learn at your own pace, when and where you want on any device. Our goal is for you to walk away more impressed with yourself than with the courses! Are you ready to learn how to make the leap to reach your goal? The minimum subscription period is one month’s access for a single course at £9.00, a bundle of 3 courses for the price of 2 at £18.00, and all our courses for a year at £120.00. That’s $12, $24 and $157 approximately depending on the exchange rate. The bundles are the ultimate success package for today’s young professional… and amazing value for money as it would cost you much more if you subscribed to every course separately! You get a 1-hour Skype coaching call with David Shindler with every bundle! That’s 1-to-1 personal support as you navigate your job search and early-career as a young professional. Reduces my reliance on luck. Saves me time and takes the guesswork out. Stops my random approach to job and career searching. Holds me to account so I take things seriously and don’t give up. Stops me being passive and lethargic about changing things. Gives me a structured approach for greater self-discipline and certainty. The approach and technology fit with learning at my own pace, convenience, and my current lifestyle. Gives my motivation and confidence a boost so I change my circumstances. Shows me and other people that I can do this. Reduces my anxiety and gets the naggers and doubters off my back. Makes me more employable than others who don’t do this. Kick-starts my working life and sets me off on the right track. Gives me a better chance of a getting a meaningful job. Helps me avoid getting stuck, aimlessly job-hopping or going down a dead-end career path. A small investment in the context of my student debt and earning potential. Easily pays for itself when I’m employed. I’m not tied down to a lengthy agreement. The school is a resource to which I can return and learn at any time. It’s an exciting challenge for this phase of my life with a worthwhile prize within reach. If we told you that from your learning you would be clearer, more confident and better equipped for job and career, what would that be worth to you? Can I trust you and this online school? “David is inspiring and motivating”, “trusted”, “warm and engaging”, “unfailingly professional”, “he’s a dream career coach anyone would wish to have.” Students and graduates. David’s current work as an experienced and accredited coach, consultant, speaker, blogger, and author ensures each course’s content is grounded in the reality of the world of work. You also gain access to his experience of developing people and organisations in a wide range of sectors over many years, and to the breadth and depth of his network of specialists and experts. 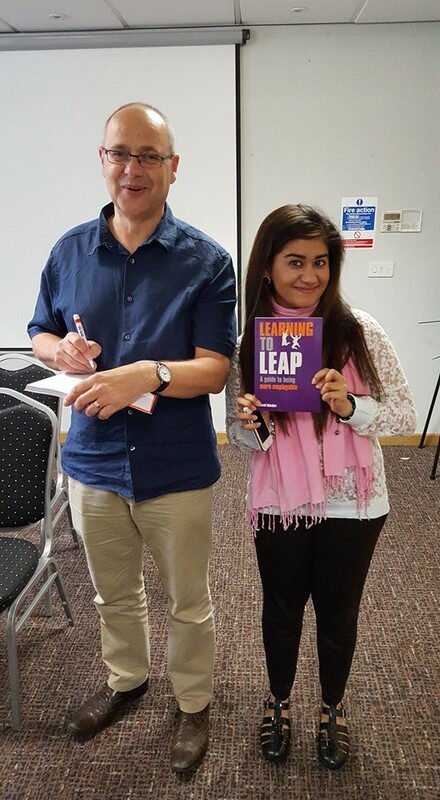 Check out his profile and testimonials on LinkedIn, and reviews of my 5-star Amazon book, Learning to Leap, a Guide to Being More Employable. We all need to learn to leap again and again in our working lives – developing new skills, new knowledge and adapting our mindset and behaviours for changing personal and business circumstances. Many people later in life say they wished they had known more when they were younger. You can avoid that trap by empowering yourself early on and navigating your career with confidence and skill. And that’s why we’ve created this online school! You won’t be alone or a faceless individual in this online school. We guarantee to respond to your questions in our closed Facebook Group. You also get the support of other course subscribers there – share, ask questions, discuss issues. David’s role is as a coach and mentor to support and challenge the Career Navigators community and be a sounding board as you navigate your way forward. You can also raise specific course-related issues with us directly inside each course through Disqus. Remember, you can work 1-1 with David via Skype if you subscribe to all the courses for more than a month. Will this get me a graduate job? Completing any of the courses WILL help you to be more employable… if you’re serious about taking ownership and responsibility for your learning and you put the effort in. The school is not for time wasters expecting a magic bullet or simply to be spoonfed. We’re giving you maximum value by providing a platform for YOU to help yourself with support. You are solely responsible for creating your own results. How easy is it to use the school's platform? The online courses are run on a brilliant platform called Thinkific. It’s super-easy to use, reliable and requires no specialist technical ability. Each course includes a short guide on how to navigate your way around. We can help with the basics if needed and Thinkific has an excellent customer service team that we can access speedily if there are any technical glitches. If you are not happy with your online courses, for whatever reason, you can claim a full refund for up to 30 days from the date of purchase. If you’re still unsure, why not get in touch for a chat with any further questions you may have? Click HERE to join our online school, sign up for courses, and start learning to leap today for a better future!